The Lewis N. Clark AM/PM pill organizer can be used whether you re traveling or you simply want an easy way to carry around your medications with you. It is designed with sixteen clear pouches, which can be individually taken out as needed. With both blue tabs and red tabs as well as numbers, you can easily keep track of which pills you ve taken throughout the day and night without accidentally missing a dose, which is especially important if you re taking prescription medications. It s also good for every-day pills intended for upset stomach, headaches and migraines, colds, allergies, and other over-the-counter remedies. Daily supplements and vitamins can also be easily organized. Instead of bringing each individual bottle with you, this sleek folding medication holder can easily fit into your purse, briefcase, carry-on bag, backpack, suitcase, etc. and you ll still have room for your other belongings. The polyester material ensures that you ll be adding virtually no weight to your bag. The Velcro closure keeps contents secure and even adjusts to accommodate the number of pills you re carrying. The exterior zippered pocket holds the medical reference card, but it s also good for doctors prescriptions, receipts, and other papers. Its subdued black color also blends in easily with your belongings so others won t even realize that it is a pill organizer. In case a medical emergency arises and you need assistance, the medical reference card includes spaces for your name, emergency contact information, physician contact information, medical conditions, allergies, and current medications, which can be very important when you re not in a local area. 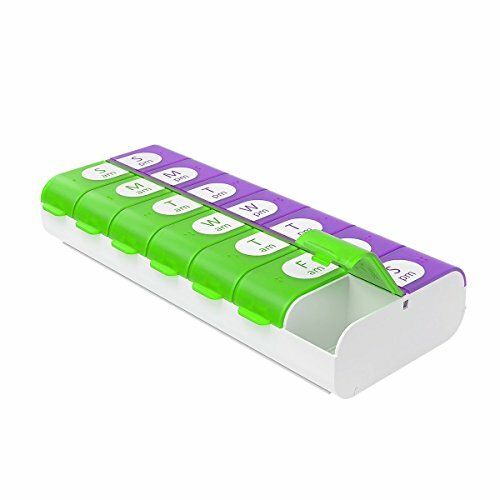 Instead of lugging around individual boxes or bottles of pills on your travels, or trying to keep track of which medications you ve taken throughout the day, save space and weight in your bag - as well as time - by using this portable pill organizer. Ezy Dose Oral Syringe with Dosage Korc - Oral Syringe - This Oral Syringe is Calibrated in TSP and mL. This Oral Syringe comes with a Dosage Korc that allows medication to be drawn directly from the bottle and has a 2 TSP capacity. The syringe also has a speacially designed plunger that will not stick after repeated use. . 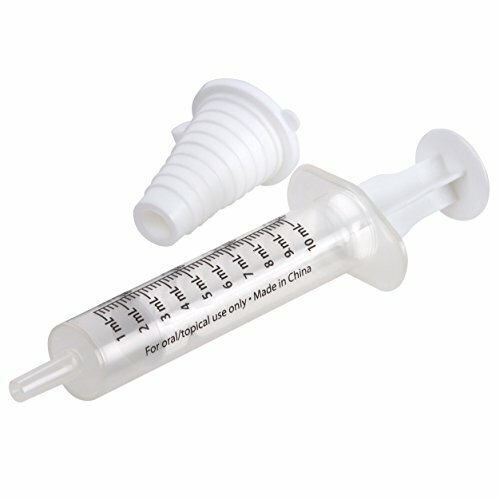 The main features of the Ezy Dose Oral Syringe include:.TSP & mL Calibration - The Syringe is calibrated for both TSP & mL measurementsDurable Plunger - This Oral Syringe is designed for repeated use with a speacially designed gasket material that does not stickIncludes Dosage Korc - Oral Syringe includes dosage korc that allow medication to be drawn directly from the bottle About Ezy Dose:Ezy Dose is the leader in easy-to-use medication management products. Many of our push-button pill planners are endorsed by the Arthritis Foundation for our ease-of-use design. Ezy Dose products make living healthier simply easier with products like pill cutters, pill crushers and a full line of easy-fill planners.. Brand: Ezy Dose Kids | Manufacturer: Apothecary Products, Inc. Choose Fullive Weekly Pill Medicine Organizer,,enjoy healthier life. Why Should You Choose Fullive Pill Organizer? Snap button lids,easy to open and pills wouldn't spill out. It can be very easy to forget if you have taken your daily medication and your health can suffer if you miss a dosage or take too many. This is why it is important to plan your meds a week at a time by filling each compartment with the number of pills you require in the morning and evening. You can clearly see through the compartment lids so if the section is empty you know you are up to date with your dosage. In addition to the Monday through Sunday compartments there are also additional sections that can be used to store spare items such as painkillers, antihistamines, headache pills and other medical capsules that you do not need to take on a regular basis. This saves you from forgetting to carry them with you and it means you do away with bulky packaging and pill pots when on your travels. If you take a number of vitamins, supplements or medicines then you will be fully aware how much space they take up in purse, bag or suitcase. Save room for souvenirs and treats when travelling by pre-organizing your pills for the week ahead. 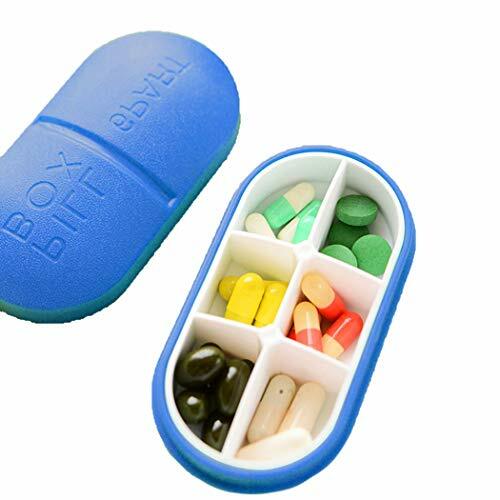 This pill box, with all of your pills neatly sectioned off can then be stowed away, taking up little room and not weighing much at all. It really is super convenient and safe! It's extra large.You can fit 30 small pills in one slot with a lot of room to spare. Discover the safer,easier way to take your medication! This provides a good amount of space,has fairly large embossed lettering indicate the day of the week and will last years of hand washing.No printed ink "flaking"or wearing off,Risk-free. The lids on our 7 day pill organizer have a positive closure and reliably stay shut.Feel confident taking them on the go - in your purse or pack.Stored in our contanier,meds and vitamins will stay fresher longer with less exposure to air and humidity. We care about your health and the safety of our materials.It's made of tough and durable food grade pp,free from BPA and phthalates.You must have noticed that most plastic boxes releas ome pungent odor,but our pill organizer is odorless and safe.All materials in our weekly pill organizer are lead-free - certified and tested by an independent lab. (Extremely Practical,Stylish! 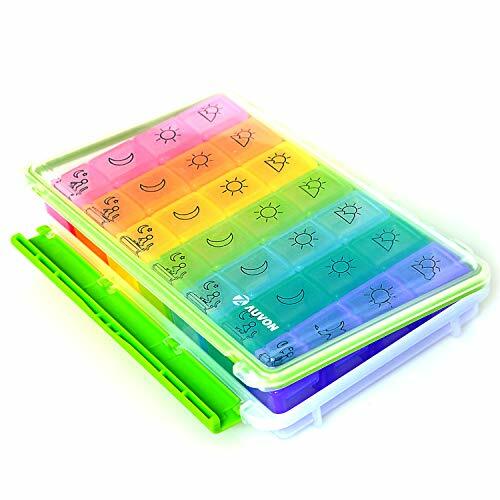 )- This pill case consists of 14 large compartments to plan your 7 day medication for both morning and night, bright & fun in its rainbow tone, translucent lids with fairly large lettering, clear and easy to distinguish. (Toxin-Free and safe! )- FDA certificated, made of Food Grade PP, won't release any sort of toxin or odor, safe for medical use. The medicines will still sustain their freshness even when stored in the box for months. With Terasako daily pill organizer, innovative design eliminates confusion, you are able to take medicines in harmony. The only one you need to do is put the medicines into each space. Terasako 7 day pill box that makes taking pills easier. 7 premium pill dispenser is an ideal way of keeping track of daily medication and vitamins. This Pill holder is very easy to open for everyone because of its unique push-tabs on each compartment. The pillbox is simple yet handy if you have to take medication once a day. Do not worry about that you couldn't put enough medicine in it, while it has plenty of space to hold your tablets and vitamins, etc. 2. After the first use, wash with mild soapy water. LARGE CAPACITY PILL ORGANIZER , you will be able to fit 6 fish oils or 10 large vitamins in each compartments. 1.Clean with wet cloth if necessary. 1 If you aren't happy with this product for any reason, we'll give you a full refund! 2 It will be a fantastic necessity for any outdoor activities. HIGHT QUALITY-- Pill case Made of food grade PP material, safe and free of BPA, non-toxic, non-allergenic, easy to clean, keep your pills clean. PORTABLE FOR TRAVEL-- Pill case for purse The three-folding box has 7 roomy compartments,can satisfy one week's amount. Small size, convenient to carry, can be put into your pocket or bag, especially suitable for short term travel, so that you can carry pills anytime and anywhere. SATISFACTION GUARANTEED-100% unconditional refund,if you receive the pill boxes that have any quality problems or not satisfied with the commodities, you can contact us any time. Do you have a hard time keeping track of all your daily medications? Have you been searching for a new way to help you remember your morning and evening meds? Then your search is over! The MEDca 31 day pill organizer features bright and colorful see through compartments you will be able to check to see if you have taken your pills for the day and you won't have to keep multiple pill boxes. 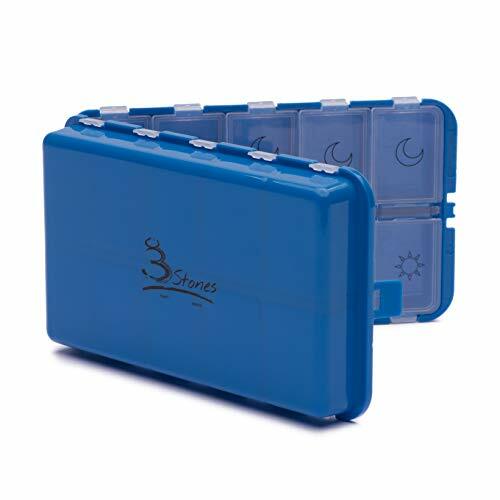 Secure and Compact Compartments that a ideal for individuals with memory loss, elderly senior people, those under multiple medications, or haven't been taking their perscribed medications. 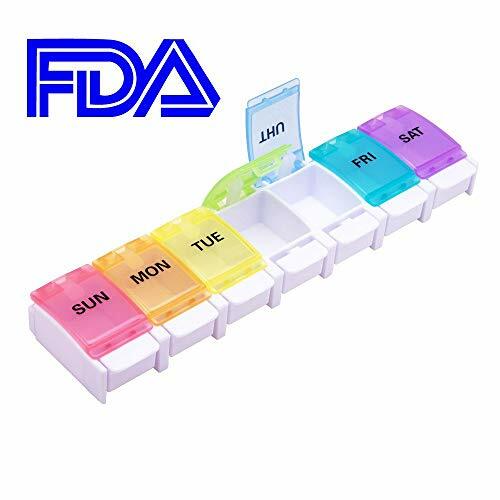 PILL DISPENSER FEATURES: 32 Numbered Compartments Bright Translucent Colors Removable Am/Pm Daily Pill Cases BPA Free, Safe & Non-Toxic Food Grade PP Travel Friendly Durable Quality Construction Ideal home health care living aid for the elderly, seniors and all ages. When looking for new health management solutions it can be difficult to find products that are trustworthy, safe, and effective. MEDca offers only premium quality home health aids and we guarantee that you will be absolutely happy with your purchase. If for any reason you are not satisfied with your order, simply send it back for a 100% refund! No questions asked! Why Wait!? ADD TO CART to order your 30 day pill organizer today! PLAN YOUR PILLS & VITAMINS A MONTH IN ADVANCE: Picture having a monthly pill organizer that is easy to load and fit all size pills so you can easily plan your am/pm medications for up to an entire month in advance. Now with the MEDca Monthly Pill Dispenser you can grab each individual daily box that you need for the day and drop it in your purse or back pocket and never worry about forgetting your pills again! 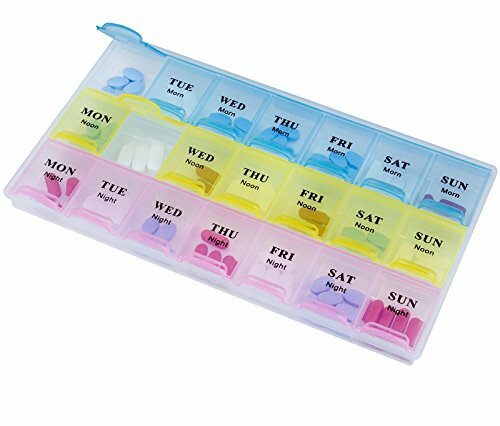 THERES NO EASIER WAY TO REMEMBER TO TAKE YOUR PILLS: Because our MEDca 31 day monthly pill organizer features 32 numbered bright and colorful translucent compartments you will be able to check to see if you have taken your pills for the day and that way you won't have to keep multiple pill boxes. 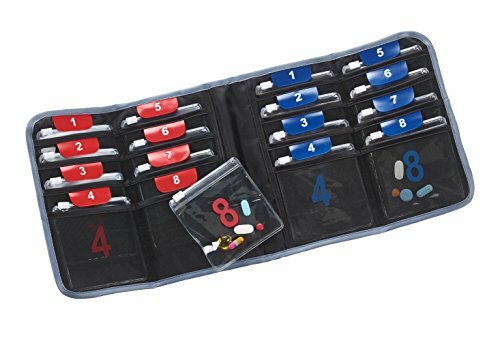 This pill organizer 2 times a day saves you time and the best option in monthly pill organizers for travel. RUGGED AND DURABLE WITH EASY LOCKING LIDS: Each Pill Box features a snap shut lid that securely locks so pills will not spill out. Our pill reminder is made of rugged and durable translucent plastic so it will not break easily even if mishandled. Holds all of your Vitamins, Fish Oil, Vitamins, Supplements, Pills and Medications all in one convenient storage space. TRAVEL FRIENDLY! 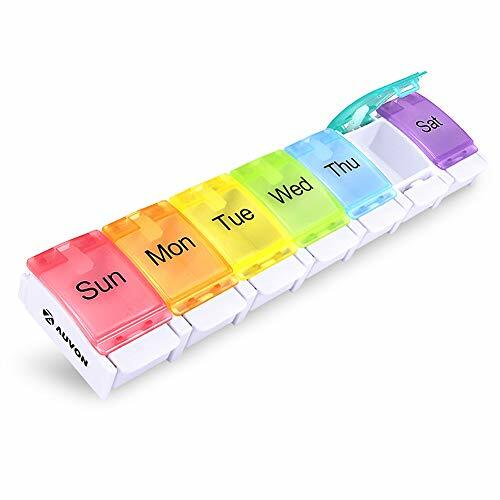 REMOVABLE DAILY AM/PM COMPARTMENTS: Our colorful monthly pill organiser sorts your supplements and/or tablets for a month in advance in convenient daily am/pm compartments which means this is great for those who take med twice a day and take each days pill on the go! Theres no better way to be worry-free with the BPA-free pill boxes keeping all your contents safe and secure! BPA FREE AND DURABLE: Each MEDca Pill Organizer is made translucent food grade PP material, thats odorless and BPA free. 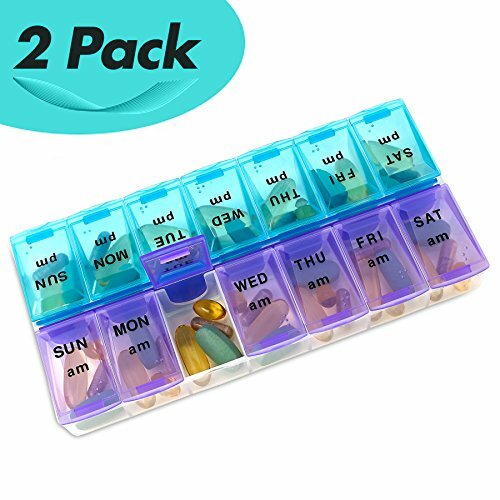 The pill organizers daily compartments dimensions measure 1- 1/2 x 1 x 1/2 and holding tray measures 8 L x 4 W x 2- 3/4 H making this pill organizer the perfect size for everyone and is guaranteed to last you a lifetime. 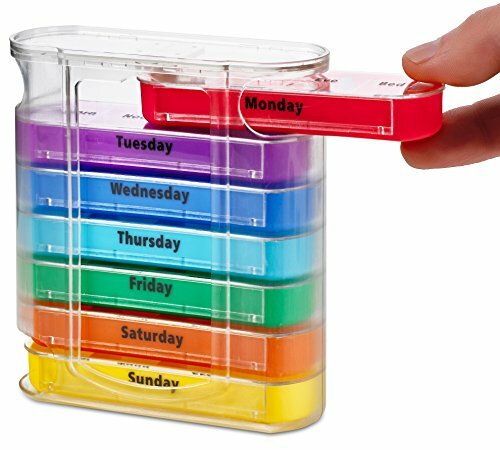 EXTRAORDINARY WEEKLY PILL ORGANIZER: This unique 7 day AM PM weekly pill organizer is designed for storing a huge lot of pills and vitamins of all sizes and shapes at a single place. It makes managing your weekly medicine prescription easy. MEDca brings for you the most convenient weekly pill organizer. It allows you to set your morning, lunch and night pills for a week without needing to track manually. If you are in a long term medication then this is a perfect accessory for you. It can be used for 7 day as well as 14 day medication. This pill organizer has everything to make it an optimal choice. It consists of 21 compartments with separate snap lids for every compartment. The lids are designed translucent so that you can check your regularity without even opening them. Each lid has the first 3 letters of a week-day with Morn, Noon, and Night label. Lightweight and small size makes it perfect for long journey. EXCEPTIONAL DESIGN: The pill organizer has a contoured design for easy pill removal. It includes 21 large compartments and lets you store medicines in bulk. The box comes in bright and attractive colors. 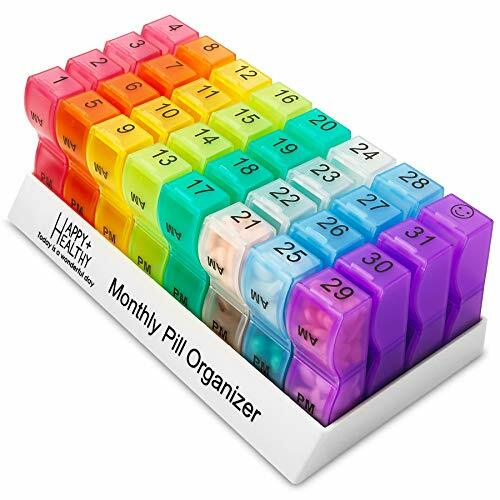 VERSATILE: Our pill organizer can be used as a 21 day or 7 day medication planner. With this you need not worry about tracking your consumption. 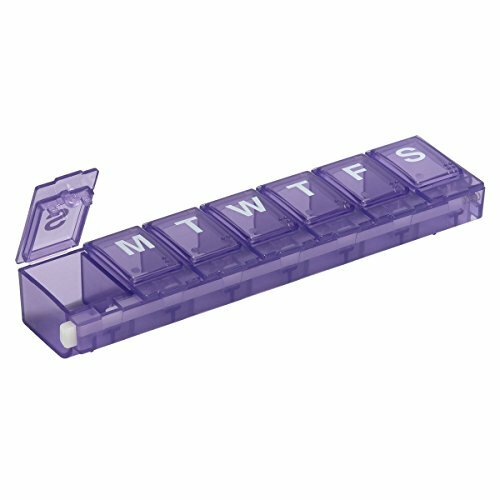 CONVENIENT AND EASY TO USE: This weekly pill reminder comes with snap lids that indicate the day of the week with letter. Its lids are translucent, so you'll know if you have taken your medicine without opening the lid. PERFECT MEDI-PLANNER: The organizer allows you to plan your 7 day medication for morning, lunch and night. It helps you make sure that you haven't missed any dose. When you decide on the MEDca (Pack of 2) Weekly Pill Planner you'll stay more organzied with all your medication and free up precious time. Now look no further as MEDca offers the best pill holders available that enables you to track your medications or supplements daily & weekly. You'll never have to worry about forgetting to take your medicine when you travel with the convenience of the MEDca monthly pill organizer case. Great for travel and especially on extended stays. Each weekly organizer fits easily into purses, overnight bags, luggage or perfect for use in your own home. No need to use a pill splitter when your pills easily fit into the oversized compartment. 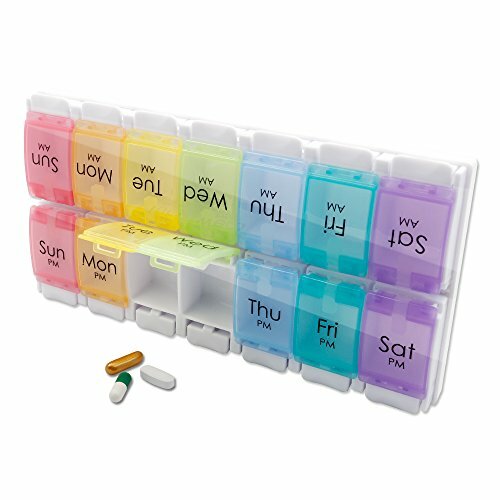 With everything you want in a medication organiser its easy to see why customers love it with features like: Organize TWO WEEKS of Medication All in One Convenient Place Perfect for travel and on the go Extra Bright Easy to Spot Translucent Colors BPA FREE Food grade PP Strong and Durable - Ideal home health care living aid for the elderly, seniors and all ages. Simply click ADD TO CART to order yours today! It's that simple! A TRUSTED CHOICE IN PILL BOX ORGANIZERS: The problem with other daily pill organizers is that the lids do not tightly lock or stay closed. Our MEDca Weekly Pill Organizer solves that problem! Why? Thats because the MEDca Weekly Pill Organizer has a locking storage case that holds your pills or vitamins from Monday - Sunday which means that you never have to worry about loose pills falling out or getting lost in the bottom of your purse. So you can be more organized all the time! 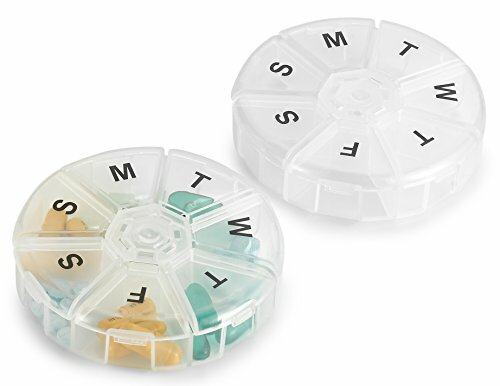 EASY TO REMOVE WITH THE BUILT IN POP-UP FEATURE: Because our MEDca weekly pill organizer has a pop-up spring feature you will be able to easily grab any days worth of pills by just opening the lid. This is great to make each compartment easy to remove and even if you have arthritis you'll get to your pills easier. Making this pill organize a great home health care living aid for the elderly, seniors and everyone of all ages. TOP QUALITY! BPA FREE. STRONG AND DURABLE: Airtight Seal and securely locks so pills will not spill out. Our weekly pill reminder storage case is made of rugged and durable translucent plastic. So you can always see the contents inside. It won't break easily even if mishandled. This pill holder is the perfect size and weight for everyone and is guaranteed to last you a lifetime. Are You Looking for a More Innovative Pill Holder to Help Keep You More Organized? Now look no further as MEDca offers the best weekly pill holders available. You'll never have to worry about forgetting to take your medicine when you travel with the convenience of the MEDca weekly pill organizer case. The innovative rounded space-saving design fits easily into purses, overnight bags, luggage or perfect for use in your own home. No need to use a pill splitter when your pills easily fit into the oversized compartment. 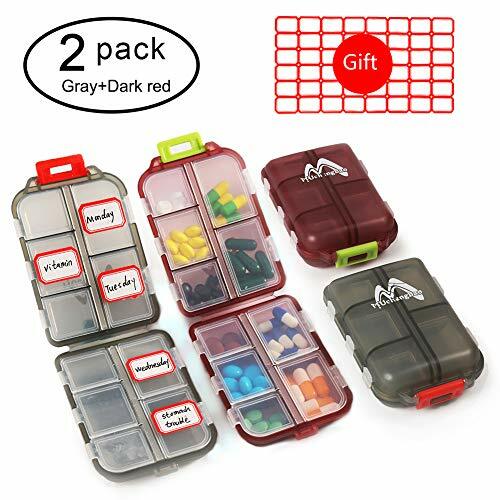 PACK OF 2 - WEEKLY PILL ORGANIZER BOXES: Our larger size 7 compartment pill organizer is the perfect helper for tracking your medication plans in daily life. The MEDca Pill Organizer is made translucent food grade PP material, thats odorless and BPA free. 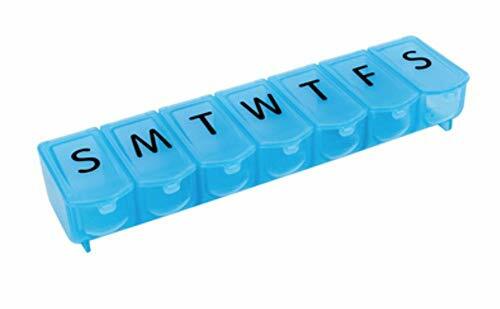 EASY TO READ JUMBO LETTERS: The bold Monday-to-Sunday markings on each pill case are ideal for assisting you to allocate the medications of an entire week in order. When it comes to your medication organizer we want to make sure you avoid mixing up medication when taking your pills of one day. INDIVIDUAL COMPARTMENTS: No more mixing pills together or mixing up the days. Each compartment of this pill organizer box is separate and opens on its own to help keep your everyday pills neatly organized. Excellent living aid for the elderly, seniors and all ages. BEST PILL ORGANIZER FOR TRAVEL: This pill case makes for a great traveling companion. Large enough to fit even the biggest vitamins or pills with extra room left over. Making the an ideal MEDca round pill container or vitamin dispenser. STRONG AND DURABLE: Airtight Seal and securely locks so pills will not spill out. Our pill reminder is made of rugged and durable translucent plastic. It won't break easily even if mishandled. This pill holder is the perfect size and weight for everyone and is guaranteed to last you a lifetime.